BMS is an important component that manages and regulates battery systems. It enables battery systems that consist of lithium-ion batteries to be used safely and efficiently. Regulate charging and discharging to allow the safe use of battery cells. Estimate and display the current SOC against the full charge capacity of each battery cell. Equalize the SOC of battery cells connected in series. We have abundant achievements in BMS development from compact storage battery systems to electric buses. 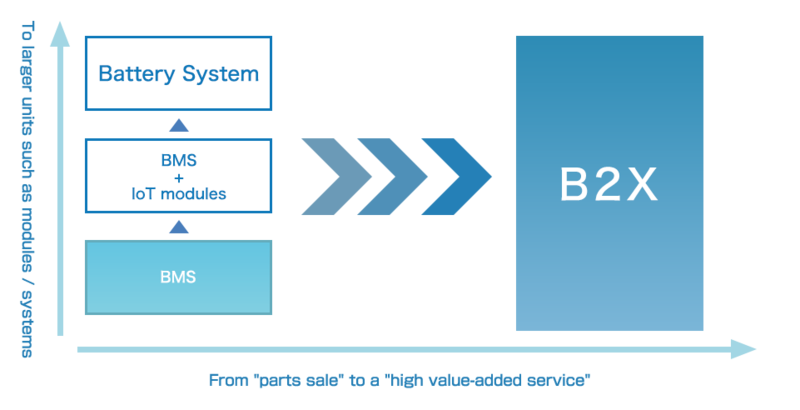 B2X is a term coined by our company, which refers to battery-related modules and services beyond the conventional BMS framework. It provides a real-time remote monitoring and various data analysis by being combined with an IoT module.